Laura Kim and Fernando Garcia’s debut at Oscar de la Renta very nearly didn’t happen. In December, rival house Carolina Herrera sued the company to stop Kim from joining the label as co-creative director until April, after the Fall 2017 season. Kim formerly served as consultant and the house of Herrera; the brand claimed she was breaching the non-compete claus. Eventually, the dramatic battle came to an end and Kim was allowed to join the brand in time for the February debut, which was yesterday. The show was unconventional. Kim and Garcia earned their stripes at de la Renta before venturing out to launch their upstart label in 2015. It quickly took off with the fashion industry and celebrities alike clamouring to wear the label’s deconstructed shirting. The Oscar de la Renta brand bought a stake in the label and appointed the duo as co-creative directors of the brand after Peter Copping’s abrupt exit after three seasons. In less than two years, the brand has seen tremendous success. They task themselves each season with reinventing their niche; investigating where their brand of deconstruction and shirting can take them and feel fresh. For Fall 2017 they decided to produce a bumper-show—a joined offering from Monse and de la Renta; in turn introducing different clientele to a new label. The Monse show opened with a ruffled blouse with a torn shoulder and asymmetric detailing. The cropped trousers with flared hemlines portrayed a polished ex-punk rock businesswoman. 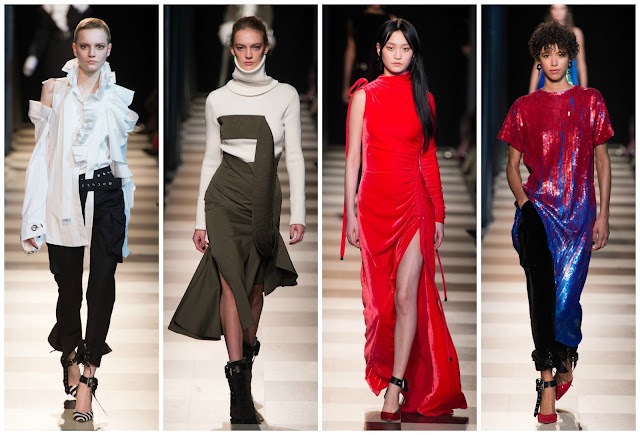 It progressed into something imitative—of Prabal Gurung, of Joseph Altuzarra. The pressure of designing two labels resulted in a loss of character. The way they use drapery and tailoring is to their advantage. One thing they’ve clearly learned from Oscar de la Renta, alongside whom they worked, is the ability to pattern cut. Their attention to detail and affinity for asymmetry distinguishes them for many of their contemporaries. Those accounted for a few standouts, but one couldn’t help but feel the collection was too much. The neck-consuming turtleneck; the sloppiness of the ruffles; the straps hanging off jackets—it was visual unappealing and difficult to assimilate. That is uncharacteristically Monse. Their past two outings have been exceptional but that was lost here. They forced the high-low amalgamation and it came off as indecisive, imprecise and largely overrated. Their success is built on nonchalant chic—this was not that. The ensuing Oscar de la Renta collection, a widely panned debut, had a major hurdle to cross. A lurex curtain that separated the catwalk failed to retract and catwalk technicians—if you want to call them that—scrambled to draw it. One side of the runway missed much of the collection thanks to the issue. Once again, unoriginality was rife. There weren’t whiffs but tangible replicas of Alber Elbaz at Lanvin and his uniquely sharp suiting. Raf Simons’ Dior iteration was strongly felt. The printed bodysuits; the bell-shaped evening gowns; trousers and an embroidered bustier with a tangerine sash—it was distinctly Dior. Perhaps it was the introduction of trousers. The de la Renta lexicon isn’t overly familiar with pants in the way the new designers are; it didn’t gel with the sophisticate aesthetic and it was too jarring an introduction. The evening gowns—something I always turned to the late Mr. de la Renta to for during my red carpet fashion blogging days—weren’t delectable. Hitherto they were infectiously sweet, laced with sugary florals and floor-sweeping. Here, they adopted Vivienne Westwood-esqe raised neckline, they grazed the calf and were more figure-hugging in ways they weren’t in the past. Don’t get me wrong: change is vital, especially to survive in the fashion industry but this was un-Oscar and too preoccupied with following the younger customer brief. As Tim Blanks noted, “Laura Kim and Fernando Garcia’s gutsy double show underscored how hard it is to design two labels at once.” I couldn’t agree more with the statement. Yes, the combined show was an interesting proposition to begin with but it didn’t push the parameters of fashion presentation. However, it highlighted the inequality between the standard of this season’s Monse collection and last season’s. 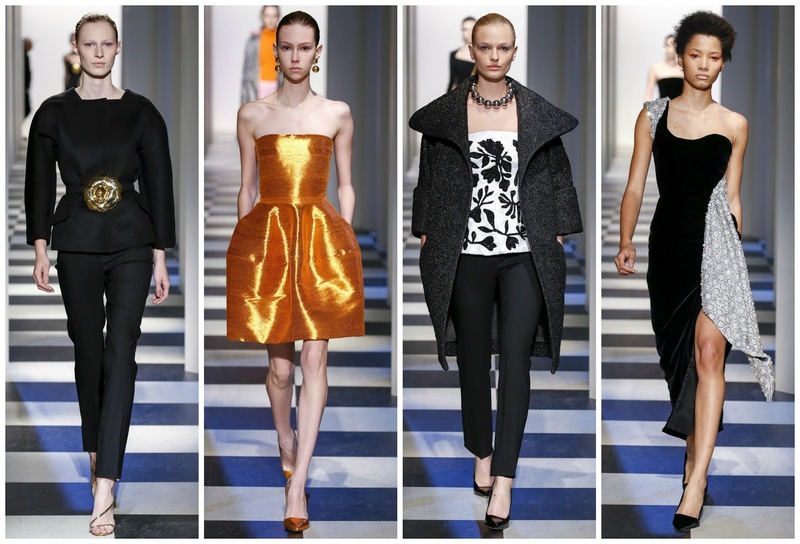 Secondly, the Oscar de la Renta customer wasn’t done justice with derivative Dior and Lanvin. Making Oscar de la Renta “young” may not be the best decision, just like making Monse for an older woman is a poor one also.